Tony.....Thanks....i believe the 3000 bridged into 8 ohms will provide about 1,000 watts which will be 125 watts per JBL....same as number 3. Last edited by trhought; 04-15-2019 at 03:08 PM. ^^ Perfect. Thanks Tim. So all 3 options (2, 4, or 8ohm) will work for 8jbl drivers boss(es) and NX3000D amp. I have some thinking to do. It's moving mass is 90% of the JBL's while it's frequency response if pretty close....only giving up about 3 mm excursion from 10 Hz to 40 Hz. It will provide more excursion than the JBL's below 10 Hz so naturally will have a gentle tilt towards more single digit ULF sensitivity which is a good thing. It only takes about 60 watts to hit Xmax so be gentle with the BOSS amplifier to prevent bottoming. Should be a great BOSS driver. Below is the WinISD model....red is Rythmik and blue is JBL. Price is going to just right. Zero! He is Mr Rythmik. I'm guessing until I get the 2nd platform built I should run the one platform with 3 JBL drivers in series for total of 12 ohms? What kind of power is that? Using the NU6000DSP. Thanks for the details Sekosche. 3 JBL's would work just as good if that's an option for you and you wouldn't have to add the second layer of plywood. Not sure if you needed the 4th driver to optimize the load for your amplifier but wanted to mention that option. The tested and approved BOSS platform only has 3 drivers and that's what @SBuger is using also. Regarding, the MA's I think others have tried them under the BOSS platform in addition to on top. The consensus reports so far has been on top of the BOSS platform is best. Makes sense to me since the MA's below the platform are coupling you and your seating back to your floor which generally isn't a good thing when trying to optimize TR sensitivity. 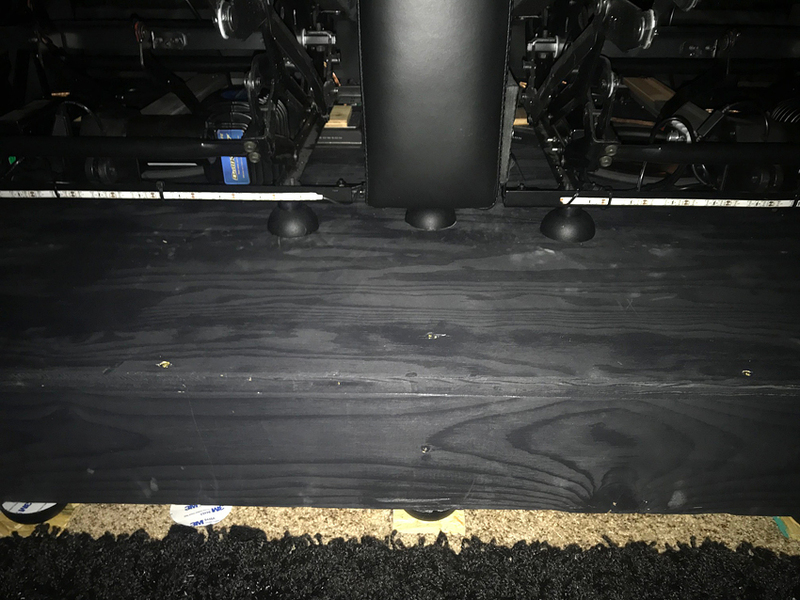 When the MA's are on top of the BOSS platform, you're completely floating your seat which is what you want to optimize TR for your theater experience. Yep I’ve only got 3 JBLs in the full riser (1 per seat) and MAs on top of platform. @Sekosche – yep they combine well on top of the riser. Thanks, Tim, for sharing your ‘baby’ with us!!! It really is pretty crazy just how realistic this thing feels once you get it dialed in well to work with your seating type. Since I’ve got room for 3 more JBLs in my full riser (6’' x 40” x 8’) I may put in 3 more JBLs for 6. I don’t even know if I need them though. At least it didn't seem like it today. EDIT: Oh yeah I forgot to mention, Im also running 28 of the Hudson 2.5" Isos. 14 on bottom of platform and 14 on top. trhought, Nalleh, brazensol and 1 others like this. Last edited by SBuger; 04-15-2019 at 07:34 PM. Hey brazensol....yep, no problems with 3 in series for now. That will be 12 ohms impedance which is harder for the amp to push current through. So power goes down to 733 watts rms per channel on the 6000. That power shared equally among the 3 drivers works out to be exactly the same as 6 drivers driven at 6 ohms....either wiring configuration will give you 244 watts per JBL. This is actually how I ran by back row riser for a couple months while I was designing the mini-riser BOSS. Then, once I added the mini-riser BOSS in parallel that dropped the impedance from 12 ohms to 6 ohms which increased amplifier current/power output and gave me the exact same power for each driver that I was getting before. Just remember, anytime you can connect speakers in parallel, the sensitivity of the system increases by 6dB because the impedance of the system is reduced while also adding another speaker that is now getting the same power. Also, there's a limit to how low you can go which is why amplifiers are rated at the lowest impedance levels which is the most current they're designed to operate. If that current gets too high (i.e. ; the impedance gets too low), the amplifier will protect itself and trip. If you want to learn more about speakers in series and parallel and how the power is shared for each speaker....below is a great website. Since I’ve got room for 3 more JBLs in my full riser (6’ x 40” x 8’) I may put in 3 more JBLs for 6. I don’t even know if I need them though. At least it didn't seem like it today. Hey Shelby so what LPF and slope did you end up with? Are you feeling stiff below 10hz? I think it may be felt but would require serious SPL and I am afraid of sending that much power to the JBLs. Also you say 14 isos on top? Can you show a pic or explain? I did not get what you meant there. Thanks, Tim, for sharing your ‘baby’ with us!!! It really is pretty crazy just how realistic this thing feels once you get it to dialed in well to work with your seating type. Hey Shelby......Thanks for the update and for your kind words. Always great to hear about your continued experiences with your BOSS....especially from a person with as much TR and ULF experience as you have. Really makes me happy to be able to share the BOSS design as my own little way of giving back....helps keeps my brain exercised also and so rewarding in many ways. Another 3 JBL's will be cool if you decide to do it......I can't see how it can hurt given your platform stiffness and you can always dial them down if needed. Good thing you decided to do a full size BOSS platform for further BOSS experiments down the road....lol. I'm extremely excited to hear about your continued BOSS designs and experiments! Keep sharpening those TR tools.....like a BOSS! Wow, that’s an awesome endorsement right there! And good news, Best Buy shipping was just acting up for the first couple days, all the drivers should all be here this week but I’ll probably just install 3 and leave the Crowsons out for now. If the BOSS is that good, especially for a smaller mini riser and love seat that I’ll be running, I might not need the MA’s because I’d need another amp anyway to run both. It would make my setup a lot easier to not have to mess with a double stack and the added height. Maybe it would help TR having both the couch and platform decoupled from each other, but I can always add more isos later. Since, I’ve got 8 more coming, think I’ll add a few more isos to the bottom and see how I like them with the Crowsons. 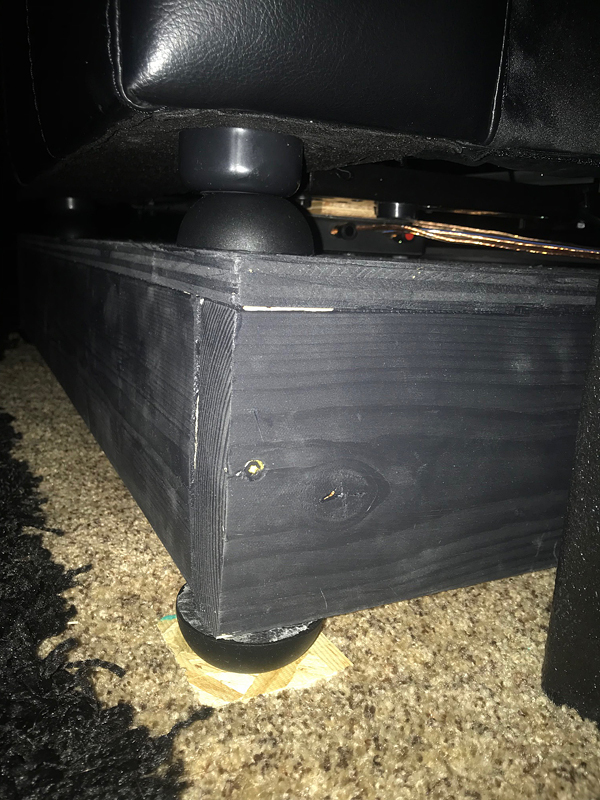 If it improves the wobble wobble, then I’ll probably just order 8-16 of the smaller ones to put directly under the couch frame between the plywood to give it some decoupling and will be good to go. I’ll be using one amp channel of an iNuke 6KDSP, so should be fine with a 12ohm series configuration, will set the limiter anyway and go from there. Edit: went ahead and ordered 16 of the 1” iso to float the couch from the riser, should work well on my 1.25” wide frame rails. Might have the BOSS done by this Friday night! SBuger and trhought like this. Last edited by Sekosche; 04-15-2019 at 09:19 PM. Hey Ray. Well I’ve got 3 of them that I keep switching between and like them all. Well, actually only one LPF, and its set at 16hz with a 12db/oct slope, but been playing with some variations on it. I can run the gain pretty high like this and not get overpowered by higher frequency TR. Yes, I can feel stuff pretty good below 10hz even at -20mv and probably feels the best overall as far as super clean and that cool yet kind of scary feel in a certain area (in between the 12-25 hz region). I just love this feel and am addicted to it. Really the only way I know how to describe is maybe a similar feel when you drop down at the last part of the log ride, or roller coaster when it hits the top and starts heading back down. Not exact but similar and a little sharper feeling in the stomach and chest area. Don’t know if that makes sense at all, but I love it and the only way I know to describe it. I got this feel with the BK LFEs too, and is why I loved and ran them in my system for quite a while. Pretty cool that the BOSS can give this feel too. More so than the MAs. Also, for the MAs to feel closer to this, I need to run a 22hz BW 12db/oct slope on them. If I could add in the BKs and still feel natural, this feeling may get almost unbearable. …LOL I think I may like that It’s probably about right at the moment though. I did have it like that a few times in my pre-BOSS setup with the BKs bringing it hard in the mix. I don’t ever remember my overall TR feeling quite this realistic though. So I’m getting a real good amount of that feel but also super duper realistic feeling too, which I love. So, I’ve been running it two other ways as well with the same 16hz 12db/oct LPF, except adding in a negative HS of -2 to -4db @ 22hz to get a little more slope, but not quite as much as an 18db/oct slope. I get a little more low end TR this way, but loose just a bit of that feeling I was talking about too. Some scenes are better with this setting, some are better with the other. Also, I’ve messed around with adding in a 2-4db LS at 10hz on both. This definitely brings up the singles, and sometimes I prefer this on certain scenes as well. IDK, they all seem to be good on my seats, so will probably settle in with some sort of combination of it. But, the 16hz 12db/oct seems to be the golden LPF for me, then tweak from there for a different effect. I may be able to run the MAs to really help boost the singles more. Smooth integration will be key though, as I don’t wasn’t it to mess up what I’ve got going on now any at all. If it does, it won’t be worth it to me. I think you’ll be alright pushing the JBLs. You’ll know it when it’s too much. I’ve pushed them about as far as they’ll go. You’ll feel them bottom and feel unnatural. Time to back it down then. It happened when I had a steep slope on the LPF and set down around 10-11hz and also had the gain higher than I should have, trying to find the limits down under 10hz. 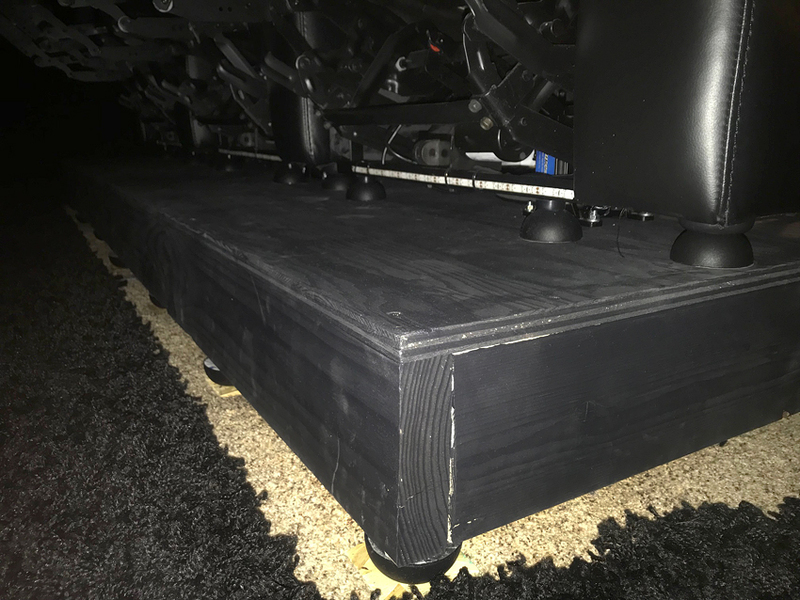 So, for the Isos, I have 7 spaced out along the front of the riser on the bottom and also 7 spaced out along the back on the bottom as well that all push into little plywood squares that sink into the carpet and pad. So that is 14 of them on the bottom. The platform is 8’ wide and just barely fits my 3 seats. I found I got better TR, at least from the VNF subs going from 4 in the front and 4 in the back to 7 in front and 7 in the back. 4 and 4 was fine for one seat but needed more once I put the other 2 seats up on the platform. So that’s 14 on the bottom. Then I’ve got 14 more on top. Mainly because I’ve got the 6 MAs on top and need Isos just like if it were on the ground with no BOSS. But it’s on the BOSS that’s fully isolated and floating (who would have thought MAs would work good like this). On the top I’ve got 10 across the front (lots of little feet on these seats on outer and inner frame). Then I’ve got 4 in the back on all the outer feet and the MAs mid way back. If I don’t end up keeping the MAs in the mix, I’ll just put isos where the MAs are now too. I’ll try it without any isos on the top as well, but really liking the feel of double stacked Isos right now with the plywood top separating them. It’s a bunch of isos, can’t believe I’m using that many. Seems to be working great though. After reading this I'm wondering if I'd benefit from adding a few more isos. I currently only have 12 under mine but I'm twice the size. I put one under each of the 12 points my couch contacts the riser. Maybe I should look at having 2 at each point along the back row and maybe the middle row. The cleats are 10"x10" and I eyeballed the iso to roughly the center. I could do 2 at each point off-center on the diagonal to spread the load out between them. It would reduce the load and compression on each one. It'll be a pain to tear the couch down again but I guess it wouldn't hurt to try it out. SBuger and Nalleh like this. I've a couple of pictures there of fitting the pair of GT5-12's in. Wired them up last night and i'm taking things gently at the moment with the volume levels of the amp. I probably need to flip the polarity, either on the amp or in the MiniDSP but I didn't get too much time to play last night after wiring them in. I'm also probably on the edge of what the amp can do with a 2ohm load as it's not in the spec's but it's what I had spare! Thanks Shelby. I am not sure I am feeling the under 10hz. I had tried some test tones and I star feeling at 10hz. Not sure if it’s due to the thickness of my BOSS or the less rigid seating. My seats are sitting a bit higher than the drivers to allow them to be accommodated so the BOSS ended up being 3.5 inches thick where the chairs sit. Any ideas how to get the feel below 10hz? See pics. My NX3000D is running in bridge mode with 3 drivers. Hey Alaric.....Thanks for the update on your BOSS build and for the link. Nice theater! Now I can see how big that one-piece platform really is! So glad to hear you're liking your BOSS experience and will be fine tuning. Also, loved the evolution pictures of your 3 different theaters over all these years.....the LOTR theater was very creative. 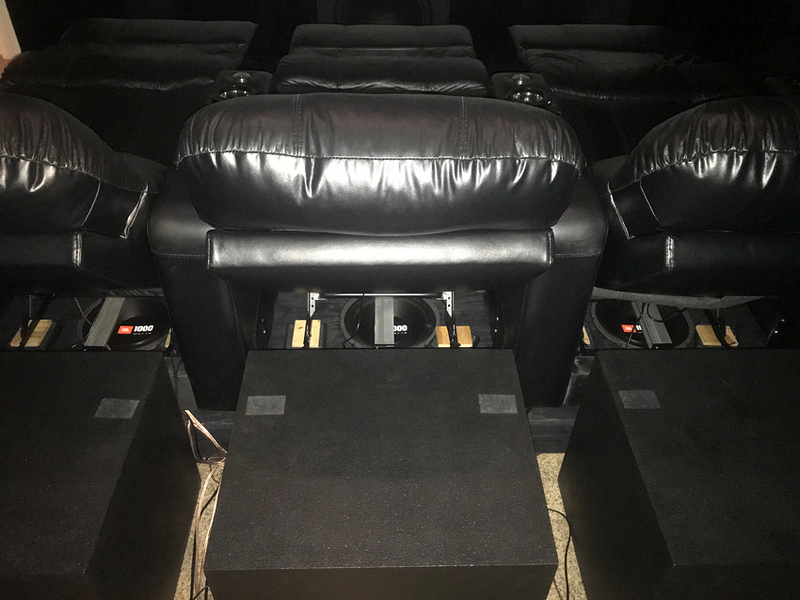 Loving the blacked out look in your current theater and that large 16x9 screen! 1 - Having drivers very close to MLP won't require them to be too loud and still get plenty of bass. 2 - I want to place Center right under the TV and the futon I use is kinda low. Putting it on top of Riser would provide good height that I can use to increase the height on TV and get a Center channel right under the TV. But you/@Carp; have mentioned that Riser can get overwhelming above 40Hz. Carp mentioned that Riser sounds very well as long as you are not sitting on it. When sitting on it, TR will overtake and you'll be shaking more than hearing . I wonder if there is a way to get Riser working to produce bass up to crossover without getting overwhelmed by TR? Here is a thought guys. Considering that BOSS can provide all the TR one needs below 20Hz, what would be the need of running subs below 20Hz????? Yeah....It's basically made out of two sheets of 8'x4' 3/4" ply with some smooth 2"x4" timber, but I over engineer and brace, glue and screw as I wanted it rigid to transfer the movement from the buttkickers at the back. The Boss set-up is just under my seat and was the area that was a little lacking. Hopefully i'll blend the 3 types into one tactile sensation, a bit like a 3 way speaker, but for tactile frequencies! Thanks the LOTR was an AMAZING space. I've saved the panels, but this set-up doesn't really lend itself to that sort of installation! This thread needs a theme song. Room pressurization. It gives a slightly different feel. When I was testing mine with the subs off for a scene like Pulse server room I was getting plenty of TR but I wasn't getting the "woozy" feeling I'm used to getting with it. Turning the subs on brought that back along with the increased TR from the BOSS. From a BOSS technology perspective, the BOSS design and experience gets better if you can float the entire platform. Sometimes that's not always possible because of the room or other restrictions (like my back row BOSS), but it's best if you can float the entire platform. Can you please elaborate ^^^. What do you mean by floating the entire platform and how one can make it float? Do me a favor and try this out. Can you do the same as you did before but this time, Set HPF so that it drops off after 20Hz. In other words, don't produce anything after 20Hz. As I remember, 20Hz and below, you don't hear anything. You just feel (motion) it. I think the "woozy" feeling might be coming from 20-30Hz. Last edited by harrisu; 04-16-2019 at 10:15 AM. Waiitttt whattttt???? You have 28 Isos????? really woowww. how far apart are you running them? Why so many? Also why on top? Is there something sitting on top of ISO that are placed on top? Please post a pic. Would be very interesting to see. By float he means have the entire platform on isos and nothing making contact with the ground. Do me a favor and try this out. Can you do the same as you did before but this time, Set LPF so that it drops off after 20Hz. In other words, don't produce anything after 20Hz. I can tonight when I get home from work. My gut says it's from <20 hz though. I never really got the sensation until I added in the 24" sub. Before it I was only good down to about 19 hz. I never tested though so we'll get the empirical tonight. I have a 29"x 3.75" x 62" Mini Riser and with 8 Isos, I don't see any part of it touching the ground. Even with Riser, it'd be the same. Don't see any reason why one would need so many risers to make sure the platform is not in contact with ground. I mean I don't thin the sheet would bend within 2 feet apart distance b/w ISOS to the point where it will get in contact with ground. Sorry, I updated the post. I meant to say 20Hz HPF and not LPF. Thx for trying it out. Hey harrisu.....floating means isolating the platform from the hard floor below you as much as possible. The isolators prescribed in Post 29 do a decent job of floating the platform. The end goal would be something like below. The absolute best case would be to have magnetic floating panels or some type of air cushion (like a hovercraft) but for the low cost goals of the BOSS platform, soft rubber is the most economical way of floating the platform. Just remember, if there's anything hard between the bottom of your BOSS platform and the floor below it that's making contact with both surfaces, your platform is no longer considered floating and the TR it can delivery won't be optimized. From the below graphic, think of putting a plate on top of the jello and how easy it would be to poke the top of the plate and watch the motion that results from that one simple poke. Now imagine putting that same plate on top of a loaf of bread and poking the plate again. There won't be much resulting motion with the bread because it's harder. Now, imagine putting the plate on top of a drinking glass and poking it....no motion at all. harrisu.....did you see Gorilla Killa's post about his mini-riser. He seems to be happy with it after comparing to his full size BOSS riser that had an 18" IB driver. Below is that post for quick reference. Yesterday and this morning have me sold the mini riser is the better experience as well. There's audible spl as opposed to the full riser I had, not interfering with the FR or experience but when running with REW sweeps it is there. 70db at -15 so its nothing when running in the pack. Its not as intense as the 18's in some scenes, but it's isn't enough for me to go to a full riser again. If I put a back row in that will be ok since I won't be sitting there for the most part anyway. Running with no lpf is growing on me quickly, reminds me of sitting in a car when listening to music. Spotify has the JW soundtrack with different mixes that all sound great. Think, The Drowning, In My Mind all sound epic. Overall great experience across the board, probably paint it next weekend and close the chapter on the build and enjoy. Last edited by trhought; 04-16-2019 at 11:40 AM. Ok guys, update again here adding to yesterdays experiences ^^^. I did tons of messing around yesterday and think I was kind of numb by the end of it all. At this point sometimes, its kind of hard to feel what's what as senses are somewhat dulled from so much of it. I have a little different opinion about it today with being fresh and all. What changed you may ask?? LOL Well, not the BOSS, I still LOVE this friggin thing!!!!! BUT, I'm truly digging the MAs being back in the mix today. The key was moving its LPF down to 16hz BW12db/oct instead of set at 22hz like I had it. So, it's set just like the BOSS now with both at 16hz BW 12db/oct, plus, running an LS @12hz ,Q of 0.8 and +3db on the BOSS and MAs. And was able to bump the level up on both by about 2db as well. @Sekosche - After you try out the BOSS by itself and your VNFs with it as well, be sure to try running your MAs with it too in the mix on top of the platform. If you can get the settings of it all right and working together as one, I think you'll be blown away with the combo. Hmmmm ...well maybe for starters try adding an LS at 10hz to 12hz like I did on top of the LPF that you are running. And or drop your LPF lower from your 20hz to a little lower like mine around 16hz. Then raise the gain on the BOSS to get more low end TR out of it. Between the two you should get more super low ULF. LOL ..I am intrigued with the mini Riser since carp said he can run it full range and has to LPF his full riser at 30-40hz. Cold be partially seating, but may be not. At any rate, I'm still loving my full riser, but does make me curios about the mini. Yeah I know, 28 isos is crazy!! I think so too, but hey, it's working so I'm sticking with it I've got 14 on the bottom, and then 14 on the top as well, mainly because I'm running Crowson MAs on top of the platform to combine them in the mix with the BOSS and VNFs. I need this many on top with 3 seats and MAs. So they are double stacked basically (in series) and also more in parallel spread out along the riser. I could do this as well even if I didn't have the MAs in there. GK runs them stacked in series as well, or at least he did with his 18" BOSS. Not sure what he's doing with the mini he just built. Ok, took some pics so you can see what I'm talking about. Real dark in my room, but did the best I could with flash. carp, DesertDog, trhought and 3 others like this.